A dentist in Jacksonville can offer a broad range of dental care from routine check-ups to a total cosmetic restoration. At the Burgess Center for Cosmetic Dentistry, our goal is to catch problems early-on to maintain a healthy mouth and to keep you smiling. We understand that the appearance of your smile makes an important impression on other people. So, if you've dreamed of enhancing your look, the talented staff at the Burgess Center can help you reach your goals for cosmetic dental improvements. Whether you are interested in our one-hour teeth whitening, deep bleaching, ceramic crowns, power braces or porcelain veneers, Dr. Eric Burgess can outline a treatment program to satisfy your needs at a price that you can afford. We provide all of our services in a comfortable, spa-like environment to make you feel as relaxed as possible during your appointment. Best of all, by using the very latest dental technology, our dental services can be performed fast, safe and with a minimum of local sedation. As an option for restoring a broken tooth or one badly damaged by decay, we offer the latest 3D dental modeling software and CEREC ceramic crowns. The entire process takes about an hour from start to finish. If you are interested in learning more about the latest procedures for achieving a stunning new smile, call us today at (904) 273-3001 to schedule an appointment with a dentist in Jacksonville. Our general dentist in Jacksonville are dedicated to providing individual dental care for individual smiles. 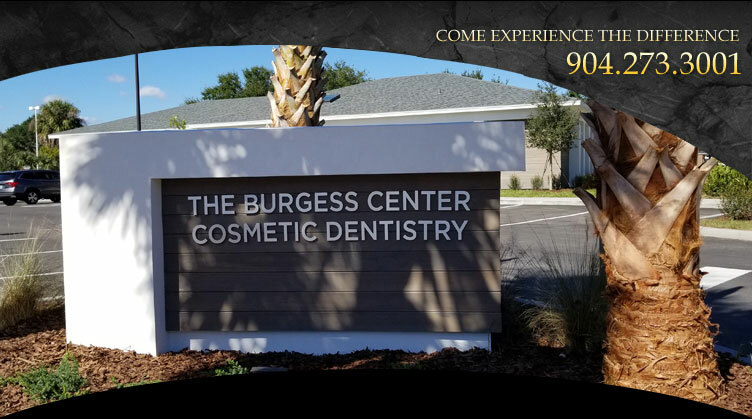 When you visit the Burgess Center, our general dentist will discuss all of your options with you prior to any dental treatments. We can take care of unaesthetic spaces between your teeth, repair damaged and decayed teeth, replace missing teeth, or restore older, less attractive dental treatments. In addition, our Jacksonville dentist can care for you by relieving dental pain, improving or correcting improper bites, and restoring your normal eating and chewing. So, whether your needs include a one-visit, computer-fabricated porcelain crown, or a life-changing smile makeover, our goal is to assist you in achieving and maintaining long term dental health. Use our website's "Request An Appointment" form for a prompt email confirmation of an appointment with a general dentist in Jacksonville.